Image 1 of 22. Click to view fullscreen. 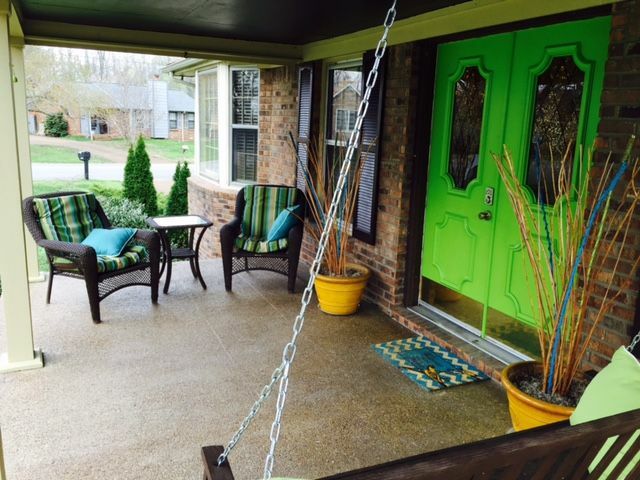 Comfortable 3BD/3BA house that has 2 living rooms, 4 Queen beds, 2 queen sleeper sofas (with very comfortable memory foam mattresses), full deck, pool surrounding by deck and privacy fence, large front porch with swing. The house sits on a corner lot in a cozy, quiet neighborhood near the airport. Easy access to interstate. 5 min to airport, 5 min to the lake,15 min to downtown, 10 min to Opry Mills mall and Grand Ole Opry house. Please note, there are two floors/levels so there are stairs. Also, the beds are all platform beds and sit lower to the floor (approx 15-18"). toilet, shower, Spa style master bathroom. Linens provided for each bed. Sleeper sofas: Linens, pillows, and pillow cases are located in the hall closet for the main level, and in the den closet for downstairs. Fireplace is NOT allowed to be used. For cosmetic purposes only. Wireless Internet provided. Pass code located inside house. Towels, hand towels, and wash cloths provided. 2 living room areas, both with TVs and sleeper sofas. At end of stay, please put all dirty dishes in dishwasher. Side-by-side stainless steel refrigerator with ice maker and filter water. Full oven, Conventional and Confectionery Settings. Powdered creamer and sugar provided. Salt and pepper shaker. Powdered creamer and sugar. Dishes and utensils supplied (enough for 10 guests). Full kitchen with cookware, plates, cups, etc. Dining table seats 6 people around the table. Basic DVD player in living room. NOT Blueray. Some books are provided on Nashville and Nashville entertainment. A few board games are provided. Steps at all entries of the house. 48" deep pool surrounded by deck and privacy fence. Pool is open from Memorial Day to Labor Day due to water temperatures. Check-in is 4pm, unless other arrangements made with owner. Check-out is 10am. I can meet guests at the beginning of stay, but will not be necessary. I am available by phone during stay, if necessary. City bus is a few hundred feet. Uber and Lyft are great sources for getting places without a car. Very close access to interstate, airport, shopping. *** For Your Info: There is a studio apartment, separate from the house and off the garage, that is rented full-time. The studio renter has no access to the house, pool, and deck, and has a private entrance. 100% refund if canceled at least 60 days before arrival date. 50% refund if canceled at least 30 days before arrival date. The house was an older home with nice updates and lots of room. Beds were comfortable, it was clean, and easy to get to, close to the interstate. Enjoyed our stay! Comfortably slept our group. Three bathrooms made it very convenient. The only thing I wish it would have had is a washer and dryer available for use. Had a great time and was glad we found a home where we could all stay together. Thank you so much for sharing your home with us! We loved the close proximity to area attractions. The house was very clean and the beds were super comfy. We felt very much at home....everything we needed was available. This is a great place to stay for a Nashville visit. Close to everything and it has everything you would need for a short or long stay. Nice kitchen for those that want to cook or just hit a local restaurant. Nice deck to have coffee at in the morning. Nice safe area and quiet neighborhood for the family to stay. Rates are subject to change until reservations are confirmed. Check-in is 4pm, unless otherwise arranged and agreed upon by owner. Check-out is 10am.